Yosemite National Park contains evidence that glaciers once filled Yosemite Valley to a depth of over 3,000 feet, almost to the top of Half Dome, and covered most of the higher elevations in the park. These glaciers are conventionally thought to have occurred over hundreds of thousands of years during several ice ages, the last of which reached its peak about 18,000 years ago. However, if one believes the entire age of the earth is only about 6,000 years, how is it possible for an ice age to have covered the mountains and filled the valleys in Yosemite in such a short time? Similar modeling was completed in 1998 using a global climate model for the entire earth.2 It was found that warm oceans produced greatly increased precipitation over the continents, particularly in the polar regions, and they could explain the Ice Age in a young-earth timeframe. But the spacing of grid points used in the model for that study was hundreds of kilometers apart. It was recommended that additional modeling be done for Yosemite National Park with a mesoscale model that had grid spacing of only a few kilometers. The basic mechanism that is proposed to form glaciers in short periods of time is a warm ocean heated by the events of the Genesis Flood.3 Geologic work was done during the Flood and heat was transferred from magma in the mid-ocean ridges to the ocean. A warm ocean would have produced a giant "El Niño" effect--increased evaporation over the ocean and moisture transported and condensed as precipitation over mountains. The first case study done in Yosemite National Park to test this theory--The Pineapple Express Storm--was completed in December 2009. The Pineapple Express storm (PEX) is one class of winter storm that affects the West Coast of the United States. It consists of a series of waves that travel along a persistent atmospheric flow from the tropical Pacific, frequently near the Hawaiian Islands, and lasts from three days to as long as a month. Some observers claim they can smell pineapples on the wind during these events. Although this may be an exaggeration, the warm, balmy air during a Pineapple Express event is certainly pleasant during normally cold winter storms. When the warm air is lifted over the Coastal Range and the Sierra Nevada, it precipitates massive quantities of rain at low elevations and snow at higher elevations. 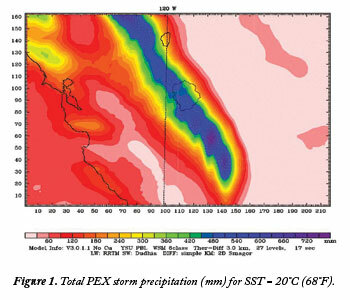 The Pineapple Express storm of December 26, 1996, to January 3, 1997, was simulated with the Weather Research and Forecasting (WRF) mesoscale model available from the National Center for Atmospheric Research.4 Six different sea-surface temperatures (SST) for the eastern Pacific Ocean were simulated. The purpose was to determine the effect of SST on total storm precipitation in Yosemite National Park. The total eight-day precipitation for one of the six temperatures, SST = 20°C (68°F), is shown in Figure 1. The Pacific Ocean upwind of the California coast was maintained at a constant temperature throughout each of the six simulations. The California coastline is shown in the lower lefthand corner of the diagram; the 120° west longitude line--the north-eastern border of California--is shown as a dashed, vertical line near the middle; Lake Tahoe is near the top center; and the boundary of Yosemite National Park is shown to the right of the vertical dashed line near the center of the plot. The colors indicate the precipitation amount for the storm in millimeters. 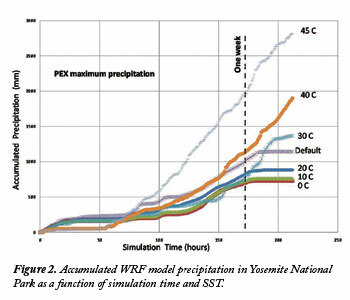 Figure 2 displays the accumulated WRF model precipitation as a function of simulation time and SST. The precipitation accumulates more rapidly for the warmer SSTs, indicating a higher precipitation rate at warmer temperatures. The actual storm had an average SST = 25°C (77°F) and is indicated as default. The difference in the accumulated precipitation is greater at higher temperatures. This would be expected, since the rate of growth of snow in clouds and the formation of precipitation should be proportional to the water vapor available for cloud processes. But the amount of water vapor is proportional to an exponential function of SST as governed by the Clausius-Clapeyron equation, a well-known chemical-physics equation that relates water vapor pressure in air to the temperature of a nearby water surface. The accumulated precipitation in Yosemite National Park was about two times greater at 30°C (86°F) than at 0°C (32°F) and four times greater at 45°C (113°F) than at 0°C (32°F). Consequently, when the surface of the eastern Pacific Ocean is warm, large amounts of snow will accumulate in the Sierra Nevada, and when it is cold only small amounts will accumulate. Vardiman, L. 2008. A Proposed Mesoscale Simulation of Precipitation in Yosemite National Park with a Warm Ocean. In A. A. Snelling, ed., Proceedings of the Sixth International Conference on Creationism. Pittsburgh, PA: Creation Science Fellowship, and Dallas, TX: Institute for Creation Research, 307-319. Vardiman, L. 1998. Numerical Simulation of Precipitation Induced by Hot Mid-ocean Ridges. In R. E. Walsh, ed., Proceedings of the Fourth International Conference on Creationism. Pittsburgh, PA: Creation Science Fellowship, 595-606. Austin, S. A., J. R. Baumgardner, A. A. Snelling, L. Vardiman, and K. P. Wise. 1994. Catastrophic Plate Tectonics: A Global Flood Model of Earth History. In R. E. Walsh, ed., Proceedings of the Third International Conference on Creationism. Pittsburgh, PA: Creation Science Fellowship, 609-622. For further study, look for Dr. Vardiman's upcoming technical paper on this subject, currently in review with Answers Research Journal. * Dr. Vardiman is Chair of the Department of Astro/Geophysics at the Institute for Creation Research. Cite this article: Vardiman, L. 2010. An Ice Age in Yosemite National Park. Acts & Facts. 39 (3): 12-13.